Turkey's President Recep Tayyip Erdogan speaks in Istanbul at an event marking the second anniversary of a failed coup attempt on July 15. Two years after a military uprising failed to topple Turkey's leader, President Recep Tayyip Erdogan has a tighter grip on power than ever. A three-month state of emergency imposed after the military's July 2016, coup attempt was extended multiple times, but was allowed to expire last week. Even so, the government's crackdown on suspected opponents, known in Turkey as "the purge," continues. On July 15, Erdogan marked the second anniversary of the failed coup with multiple events. At one, he stood on a bridge crossing the Bosporus Strait and reminded a large crowd of the civilians who had confronted tanks and bullets on that bridge two years earlier. Some 250 people were killed, a lesson Erdogan said Turkey would never forget. "July 15th showed us once again who are friends of Turkey, even at difficult times," he said. "We as a nation have a very strong memory." That memory also extends to those considered enemies. So far, the purge has seen more than 130,000 people sacked from their jobs in the military, police, civil service and academia. Tens of thousands more face charges. Many are charged with having ties to the exiled cleric Fethullah Gulen, a former Erdogan ally who lives in the United States. Turkey blames Gulen for the coup attempt. The government has dubbed Gulen's movement "FETO," short for "Fethullah Terrorist Organization." Gulen denies any involvement in the failed coup. Ankara has asked Washington to extradite Gulen back to Turkey to face charges, but thus far, the U.S. has not acted on the extradition request. It's one of several sore points that have strained U.S.-Turkish relations. "All dissent is under oppression"
Critics of the purge say it has swept up not only coup supporters but also Erdogan's political opponents. Some of those charged with crimes — punished for what they say is legitimate criticism of the government's policies — say the state of emergency may be over, but the purge shows no sign of finishing. "So the state of emergency may be ending, but the mentality will continue," says Akin Atalay, chief executive of the Cumhuriyet newspaper, a publication that has been around almost as long as the Turkish Republic. More than 170 media outlets have been closed since the coup attempt, but Cumhuriyet's secular, nationalist editorial line continues to survive. It has not, however, escaped the government's crackdown. Atalay and more than a dozen others at the paper — journalists, editors, cartoonists, lawyers — have been convicted on terrorism-related charges. They continue working while they press their appeals. Even considering Turkey's long history of military coups and repression of dissent, Atalay says what's happening now is unprecedented. "It's the most anti-democratic I've seen it," he says in an interview at the newspaper's Istanbul offices. "Critics are thrown in jail, all dissent is under oppression all the time." He says in today's Turkey, there are "thoughts they allow you to think, and other thoughts you are not allowed to think. And if you dare to think it and voice it, you're going to be punished." 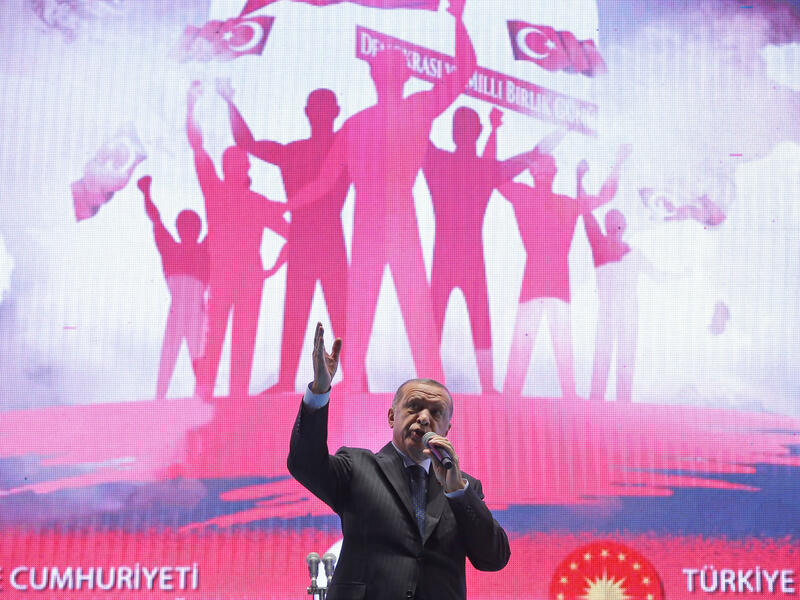 Erdogan was re-elected in late June, winning another five years in office and gaining new powers in the process. Following a referendum last year, the Turkish presidency is stronger than ever, wielding broad executive authority formerly held by the prime minister, a position now abolished. The new system, critics say, provides very few checks on presidential power. Parliament — led by a coalition between Erdogan's AK Party and the nationalist MHP — is cooperative, and the judiciary, Atalay says, has been "crushed." When the sentences were handed down against the Cumhuriyet journalists in April, Human Rights Watch said the courts were acting as "willing handmaidens for state repression." The only apparent restraint on presidential power appears to be the fear of economic fallout. One of Erdogan's former deputies, Mehmet Simsek, appeared to acknowledge as much when he told a TV interviewer that the state of emergency was being lifted in part to shore up the plunging Turkish lira, which has lost more than 20 percent of its value against the dollar this year. "The negative public perception of the state of emergency, and global market volatility, are the reasons for the Turkish lira's record plunge against the dollar," he said. "Therefore, lifting the state of emergency would 'normalize' Turkey again." Erdogan's supporters say his tough response to the coup attempt is entirely justified, and with the lifting of the state of emergency, Turkey is beginning to return to normal. But parliament is busy enshrining some of those same emergency powers into law, critics note. The move has been condemned by human rights groups. Meanwhile, Turkey's military, which has acted in the past as a check on presidential authority, has lost some 10,000 members — including many generals — to the purge, and appears comfortably under Erdogan's control. Turkish media is also now primarily pro-government. Atalay says Cumhuriyet is proud to be an exception, and he likes to remind young Turkish journalists that the worse things get, the more important their work becomes. "Apart from all the dangers, I tell young journalists they should live the joy of the fight to bring justice back to Turkey in these very difficult times — the worst conditions, I would say, in the history of the republic," he says. "But even on the hardest days, they understand the value of their work." These days, Atalay and his colleagues carry on working with prison terms hanging over their heads. They're waiting to find out when their appeal might be heard.